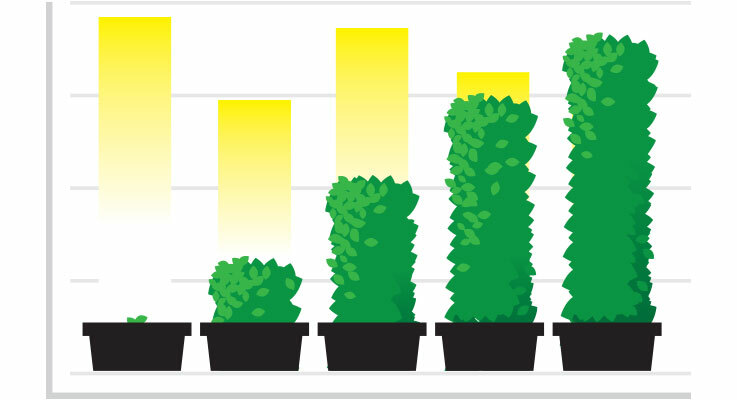 Any experienced grower or supplier will continually evaluate the performance of their business. From measuring the intake of supplies for production or calculating the costs for off-loading inventory, a successful business makes continuous adjustments to streamline their operation. 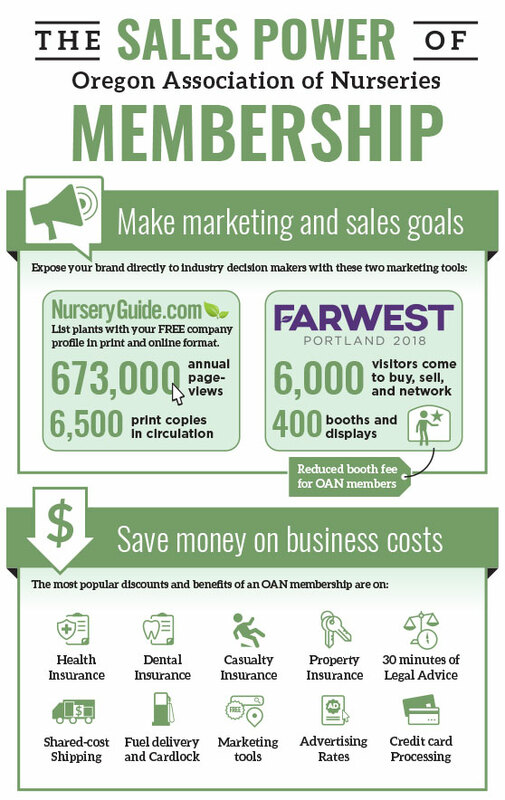 The Oregon Association of Nurseries has created a portfolio of member benefits that are designed to help a company improve its performance outcomes, thereby justifying the membership investment and then some. Denny and Joni Hopper, Hopper Bros, shake hands with colleagues and potential clients at the Farwest show. For those considering joining, as well as those who want to get more from their membership and even those who want to recruit their friends, we’ve put together these answers to common questions about OAN membership. Will the cost of a membership help my business profits? Yes. OAN offers voluntary programs with cost-saving measures in mind. • Trucks to Trade Shows transportation program is a favorite option for savvy nurseries. Forgive the simplistic explanation, but it’s like carpooling your products to work. Instead of incurring a considerable expense for independent drivers to ship products nationwide to events like MANTS or NorCal, this truck-sharing program makes an effort to split the cost of transportation with other OAN members by consolidating shipment needs together. • Discounted fuel delivery and cardlock fuel discounts through Supervised Fuels is cost-saving benefit members, where participants save money in proportion to their fuel consumption. • 30 minutes of free access to legal professionals each month is offered to OAN members if they have questions regarding business-related legal issues. The OAN Legal Access Program and Jordan Ramis, PC will advise a concerned member of any steps they may need to take to resolve a potential issue. • Health, dental, property, and casualty insurance programs can be provided for members and their employees. Endorsed by OAN, Leonard Adams customizes insurance plans with the best pricing for the unique risks of member businesses. Leonard Adams has more than 100 insurance companies to choose from, and with that many choices, it’s hard not to find the right option. Large carriers, such as Providence Health Plan, will offer a nursery owner a reasonable rate based merely off the amount of risk that is statistically calculated for their profession (known as a standard industrial classification, or SIC rating). However, some businesses have both a retail and landscaping component, and there’s not one insurance carrier that can cover one activity in both categories. Leonard Adams can review 20 companies in just one call. Will a membership get me more customers or business partners? Yes. Every experience the association produces is meant to embolden invested growers with new ideas for increasing their sales, profitability and production efficiency. OAN will also enhance their company’s exposure to both print and online publicity channels. • Farwest Show, produced by the OAN, is the largest green industry trade show in the West. More than 6,000 people typically browse the 400-plus exhibitor booths around the Oregon Convention Center in Portland. This event will put a company’s brand right in the same room as all of the industry’s top buyers, growers, retailers, and suppliers. Sponsorship advertisements reach about 18 different countries and decision-makers from all 50 states. “The OAN was immensely helpful when we first started our business,” said Leigh Geschwill, co-owner of ‎F & B Farms and Nursery, and former president of the OAN. 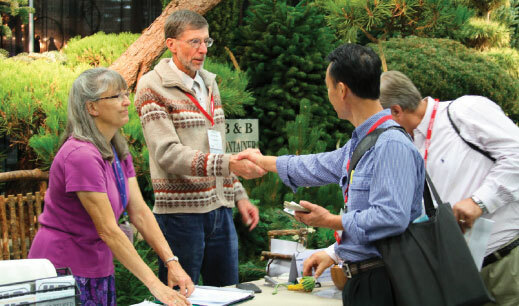 “Attending chapter and committee meetings, and exhibiting at the Farwest Show helped create valuable industry connections that we still rely upon today. • A free profile in Nursery Guide and NurseryGuide.com, which receives more than 10,000 visits per month, is a standard OAN benefit. Serving as both a 350-page printed catalog and search-friendly website, this publication is a resource for growers and buyers of wholesale plants, industry services and supplies, looking to do extensive business. With nearly 5,500 plant varieties and more than 23,000 total plant and service listings, 6,500 print copies are distributed throughout the year by mail or at other trade shows. Each public company profile is easily customizable, granting the owner access to list the details of each plant, product and service they have available. The first listing is always free for members, and additional listings start at $6.25 each, going down the more you buy. • Retailers, landscape providers and Internet retailers receive a free listing in Retail Nurseries & Garden Centers Guide, which reaches nearly 25,000 gardeners yearly. The guide includes a listing of suppliers, landscape designers, contractors and arborists. Will a membership help my business grow? Yes. As professionals who have a bottom line that is dependent on nature’s plan, it would be great to have a crystal ball and predict the weather. With OAN’s integration into Salem through to government relations initiatives, they can predict which way the winds are turning by being involved in the discussions of creating laws that decide how a nursery business can grow. Then-OAN President Mark Bigej, Al’s Garden Center, sits next to Oregon Gov. Kate Brown (right) at the 2017 Farwest Show, discussing various issues of importance with members of the OAN Government Relations Committee. There are a lot of big, somewhat amorphous topics the legislation discusses every year. Water policy, land-use practices, and transportation policies will all influence current and future business decisions. There’s also discussion of wage rates, or employer mandates on sick time and family leave, or even overtime pay that could conceivably affect the green industry’s labor force. “The strength of our diversity tells a great story about the needs of the industry,” Stone said. The OAN works for the entire Oregon nursery industry, making the state a better place to do business. The more members the association has, the more power and resources they have to solve problems and protect the nursery industry. What are some successful outcomes of the OAN? As testimony to the effectiveness of the OAN’s influence, when national and state agencies wanted to enact water quality regulations, Stone was at the table with Oregon’s governor to craft a long-term solution to water quality. The fallout of that decision would have had a significant impact on all plant production, and he was there to share the ideas and interests of the OAN members. If a member uses the membership benefits, then they will see a return on investment. The OAN members are a well of wisdom and experience. The association will keep its network abreast of pitfalls and issues owners may not see coming. The value of the OAN community comes from those who are present and participating. That’s why it’s important to bring in new members. If you know someone who isn’t a member, you might ask: what are their interests? What strengths do they bring to the industry? What’s their passion? Encourage them to become a part and get more involved and the OAN network that is already at work for you. Together, the members have groomed strong program initiatives stemmed from the conversations between experienced nursery growers, greenhouse operators and suppliers. They may not be next-door neighbors, but they are a community of like-minded business people with needs unique to their work. The OAN is a secure, reliable investment that grants you access to services and opportunities, many of which alleviate burdensome out-of-pocket costs.